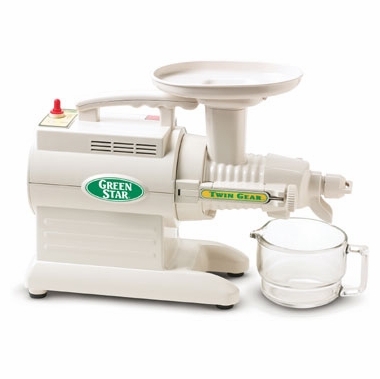 The Green Star GS-1000 Basic Juicer and Food Processor has all the basic juicing and food processing equipment. Some accessories which are not frequently used have been excluded so we may offer an economical price. The Green Star GS-1000 can process whole foods making such favorites as pie crust from almonds and dates, pates from nuts and vegetables, sauces from a vast array of combinations, baby foods, and frozen fruit desserts, and more. The choice is yours! Love this juicer. Bought its predecessor 17 years ago and after daily use finally gave out. Replaced it with the new Green Star and am very glad, after considering other juicers, I stuck with the tried and true. Thank you Green Star for remaining true to your heritage!